If you think about it, the use of mouth-guards and the reasons for using them isn’t that far removed from orthodontic technology and the principals at Affiliated Orthodontics we employ to create a beautiful and healthy smile for our patients! Mouth-guards: Not Just a Good Idea but a GREAT One! Working together as a team is needed to create a beautiful smile. We can’t do it ourselves without patient cooperation and we all work together to ensure a healthy final dental result to last a lifetime! So why should it be any different with the use of a mouth-guard? The facts speak for themselves: Studies have shown that mouth-guards prevent well over 200,000 mouth or tooth injuries a year! Individuals are 60 times more likely to damage their teeth when not wearing a mouth-guard while engaged in contact sports or rigorous physical exercise. Why risk making yourself another statistic? After all the time and effort you go through straightening your teeth why risk damaging your teeth, resulting in unnecessary costly dental work and discomfort. – Losing one or more teeth due to lack of a mouth-guard is trauma enough for most individuals. But would you believe that over a lifetime you may spend as much as $10,000 or more per tooth to repair the damage. Do the math… it pays to wear a mouth-guard. – Mouth-guards used to be used primarily for the sport of boxing but the benefits of wearing a mouth-guard has spread over to dozens of different contact sports including basketball, bicycling, ice hockey, and even volleyball. 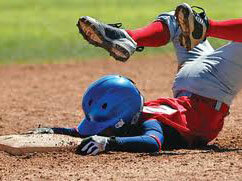 When in doubt, wear a mouth guard, even when playing unorganized contact sports with friends and family. The logic is seen in black and white. Protect your teeth and protect your smile by using a mouth-guard. Better yet contact us today to learn more about mouth-guards and discuss any other questions you may have regarding the protection of your mouth and teeth.